These two maps show all the bus routes on Korcula island. 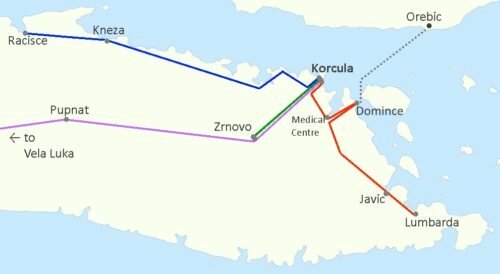 The first map shows the lines between Korcula town and nearby villages in the eastern part of the island, including the ferry port at Domince (pronounced Do-min-che). On the second map, below, you can see the route between Korcula town and Vela Luka at the opposite western end of the island, a distance of about 50 kilometres. Korcula island mountain bike tour through the rolling countryside. Sample local wines, swim in the Island’s hidden bays, then relax with a delicious lunch of fresh ingredients. Taxi boat from Korcula town. Find your own secluded beach or hidden bay. Useful too when you miss the last bus.